15 incomparable Ice Skating Rinks that will completely dazzle you! The design for ice skate blades hasnâ€™t changed very much since the Dutch started using metal blades sometime 13th or 14th Century. However, a lot of things related to the sport have changed quite a bit. The boots are more comfortable, we have Zambonis to clean up the ice, the fashionâ€™s arguably improved quite a bit. We can even skate indoors now. Still, it can be nice to get back to basics, even with an indoor rink. 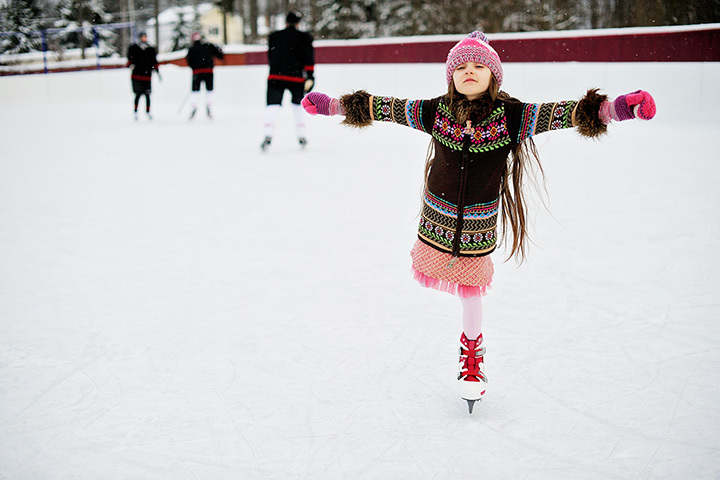 Here are 15 of our favorite, most unique Ice Skating Rinks that will bring out the best in every skater! If you want a truly classic experience, the choice of rink is clear: the Calumet Colosseum of Calumet, Michigan. Built in 1913, the "Colosseum" as it's spelled, is the oldest continually operated ice skating rink in the United States. It stands to reason that a rink that has been in operation for more than a century will have accumulated some history, and fans of hockey will appreciate some of the stories that unfolded in those hallowed halls. Of course, there's something to be said for outdoor skating too. Even in a concrete jungle like New York City, being able to glide across the ice while looking up at a clear blue winter sky is simply wonderful. One thing a lot of out-of-towners don't realize though is that as iconic as the Rockefeller Center rink is, it's not the only or even the best option in Manhattan. Check out the Rink at Bryant Park. The much larger rink offers more ice time with less waiting, and is at the center of a hip collection of booths selling everything from fried pickles to handmade jewelry. If the city isn't your scene, consider the rink at Squaw Valley in Lake Tahoe, California. There are plenty of ski areas that have ice-skating of one sort or another, but those are usually part of the base lodge, and the experience isn't all that different from going to any standard rink. But at Squaw Valley, the rink is located at the top of the mountain. After riding the ski lift up, you can enjoy skating at 8,200 feet in the beautiful Sierras. Everywhere you look from this open air covered rink will provide you with a gorgeous view of unspoiled wilderness. You would think that a rooftop ice rink would be a risky proposition, but in Las Vegas it's still a safer bet than the slots. The Cosmopolitan hotel located on the world famous Las Vegas Strip offers high class skating. You can enjoy cocktails mixed by acclaimed bar-tenders as you twirl on the hotel's frozen rooftop pool from November to January. Day or night, free admission to the rink means you'll be able to appreciate one of the most unique views of the Las Vegas spectacle there is. If you like the "skating" part more than the "ice" never fear, you can work on your triple axle beachside in California. Visit the outdoor rink at the Hotel del Coronado in San Diego and you can trade pine trees for palm trees. You can actually work up a sweat on this 10,000 square foot rink, so winding up on the ice can actually feel kind of nice. You can also soak up some rays and watch the Pacific Ocean roll into shore as you skate. Bring some sunscreen for this one! Minneapolis, Minnesota is the home of the Depot Rink, an example of a "recycled" rink. The building was originally a train station, and the architecture still reflects this, with high ceilings, old stone walls, and huge window banks along one wall letting skaters take in the city's skyline. As a bonus, the Depot Rink is actually kept warmer than the city outside the windows through much of the winter, but if you're still chilly, the rink is attached to a hotel with high-end dining options. If you want to show off your skills, the Ice at the Galleria is located right in the center of a mall in Houston, Texas. This is a full service rink, and classes are actually carried out as shoppers peruse the stores. Around the holidays festive decorations including a Christmas tree adorn the rink, but it is open year round. But as the day winds down, the rink is known for DJed parties with lights and the latest music, which helps make the Galleria your one stop for holiday shopping, activities, and partying. Miami certainly isn't a city that comes to mind when you think of ice-skating. But strapping on a pair of skates at the Basement is a great way to have fun after the setting of that hot Florida sun. The Basement is trying to "reclaim" the disco scene with an emphasis on inclusion and fun, and the ice-rink offers just one way to move and groove to their collection of exotic music. With an extensive bar, a bowling alley, and a huge dance floor, this is the perfect antidote for anybody who's gotten tired of rinks that just play Christmas tunes on repeat. The Curry Village outdoor rink at Yosemite is really something else. While Curry Village itself is a classic ice-skating rink that offers a pure winter experience without any frills or distractions, the setting really sets it apart. California's famous Half Dome and Glacier Point provide the backdrop for skating, providing breathtaking scenery that makes even a basic figure eight something special. Don't forget to buy supplies to make s'mores over a campfire at the gift shop. 10. National Gallery of Art , Washington, D.C. When the weather gets colder the National Gallery of Art adds the medium "poetry in motion" to its collection with the opening of their rink. Possibly one of the most romantic sites for skating in Washington DC, this classically styled rink sits in the shadow of the National Gallery's Neo-Classical faÃ§ade and is surrounded by some of the collection's large-scale sculptures. And if you're single, don't worry, the rink hosts beginner's skating lessons for adults that feature a meet and greet in the cafÃ©. Come back in the evening for more classes with spiced wine, or just to see the simply elegant lighting under a star studded sky. The Windy City offers some of the best free skating in the country. The McCormick Tribune Ice Rink in downtown Chicago is free if you bring your own skates, although rentals are still only $12. The rink is part of the Millennium Park project, which highlights the best of what Chicago, Illinois, and the rest of the world have to offer through sculpture, rotating exhibits, and galleries. The area offers an exciting blend of modern architecture and classical styling, and exploring the rest of the park is almost as thrilling as being on the ice. The Boston Frog Pond doesn't have any frogs in it these days, and it's technically a rink not a pond, since it has some cleverly hidden technology providing an amazing ice-skating experience, but what you see is still what you get. And what you get is a traditional New England rink right in the middle of Boston Common. While not exactly a secret, the Frog Pond is not the best-known tourist destination in the city, so you can usually take a few turns without feeling crowded out. And if you're interested in watching others skate, the Frog Pond is also the site of several ice shows during the year that are worth checking out. For a high-end skating experience, check out The Queen Mary Hotel's CHILL. The hotel's giant dome is frozen over and fashioned to look like an igloo. Giant ice sculptures throughout with some reaching two and a half stories tall. While celebrity sightings are not guaranteed, gliding across the ice before taking a seat in a cozy cabana will leave you feeling quite glamorous yourself. CHILL is actually an event, and may take place at other hotels in the Los Angeles area, so be sure to find out where it is this year. Lake Morey in Vermont is all-natural, so in order to really enjoy this lake you need to pay attention to the weather, because the same surface conditions that impact ski trails will impact the lake's surface. The extra work will certainly be worth it though. The Lake Morey resort maintains a 4.5 mile trail popular with speed skaters, but the rest of the lake's 536 acres of surface area can also be skated, and if that's enough all sorts of winter sports are available in the surrounding area. If you're after both size and consistent quality in your ice, you have to go to Keystone Lake, part of the Lakeside Village development at the Keystone resort. The 5-acre surface area is regularly treated with a Zamboni, which makes it the largest maintained outdoor rink in the country. The Rocky Mountains provide a scenic backdrop all around the lake, and you won't want to miss the chance to join one of the pick-up hockey games or impromptu skate-offs the lake is known for.